There’s a few factors in play. Initially, developers were using TGAs, as they are generally the basis for most game art. They give you good quality, transparency channels, and are readable by any decent app under the sun. Unfortunately, they also gobble memory like there’s no tomorrow. If you don’t have a technical director overseeing a project, you suddenly get a mod full of super-high-res beautiful textures (or a huge mod with lots of smaller high-quality textures) but you can only use so many of those before crashing. Another thing modders need to watch out for (who don’t have experience with game-specific art) non-square textures can take up as much texture memory as a square texture the size of the longest side of the image, because of the way game engines and graphics cards may process textures. This is not a 100% rule, see these threads (polycount.com) for more info and tips. Truth be told, cutting resolution isn’t usually a huge sacrifice. Texture compression (such as DXT) and good resampling can give you excellent quality without significant sacrifice in visual fidelity. 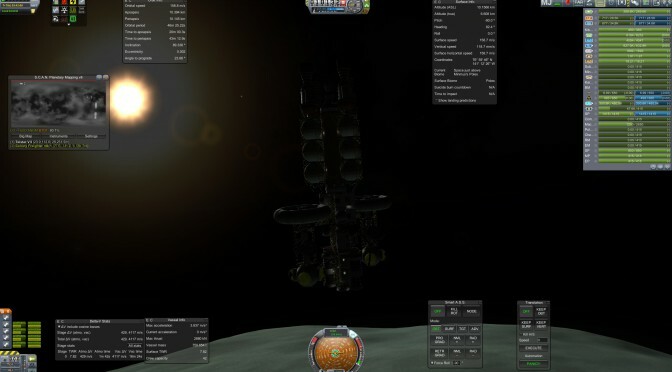 KSP modders have come up with a few fixes for this problem. Load batches of different mods, depending on what part of the game you’re playing. Active Texture Management: A great mod by rbray89, which will read the game’s (and other mods’) textures, and compress them and store them in a texture cache for better memory utilization. The utility is also configurable for quality or increased compression values. DDS loader: TGAs, PNGs, etc., are not a format native to graphics card processing. They need to be interpreted for drawing on your screen. DDS format is one that is more of a native format for your GPU to process, and allows improved loading time because of the lack of processing. To take advantage of this, Sarbian released DDS loader, which allows KSP to make use of the optimized format. For Windows, KSP to DDS will allow you to batch convert the base game’s textures, as well as mods’ into DDS for the plugin to use. UPDATE (2014/11/24): I haven’t done comprehensive testing using FRAPS, but it appears to the eye that enabling threaded optimization for OpenGL in the NVIDIA control panel will improve your framerate consistency. Because I get a higher framerate in DX11, and the source textures are all high quality, I went with the last option. Not as low on utilization as OpenGL, but noticeable performance improvement across the board, as well as better display of normal maps on my hardware. (GeForce 7-series). UPDATE (2015-06-10): It has come to my attention that something appears to have changed with the DX11 command line option. Previously, I saw no difference using -force-d3d11 vs. using the “no-singlethreaded” option listed above. Now, I find that -force-d3d11 allows me to run the game when only OpenGL would allow me enough memory to do so previously. I am currently using both ATM and D3D11 on KSP 1.0.2, however as more mods transition to DDS format textures, the need for ATM goes away. See my list of 0.25-compatible mods I’ve tested and use. So it’s either opengl or dx11? What would happen if I add both of the following to the command line parameter? Would it not work? or work as well? OpenGL and DirectX are two different ways to display the graphics of the game, so you can only choose one. (Specifically Direct3D vs. OpenGL). They are what are known as graphics APIs. They interpret the game code into graphics for your screen. DirectX 9 is the default mode for Kerbal Space Program. DirectX 11 is a newer version of the API that supports new features and performance enhancements. Switching to DX11 without using the single threaded flag as listed in the article is known to cause graphical issues. Generally, in Windows, you will get better performance with DirectX, but higher quality/more consistent results with OpenGL, which is why it is frequently used for professional applications. Hope that all helps and makes sense!